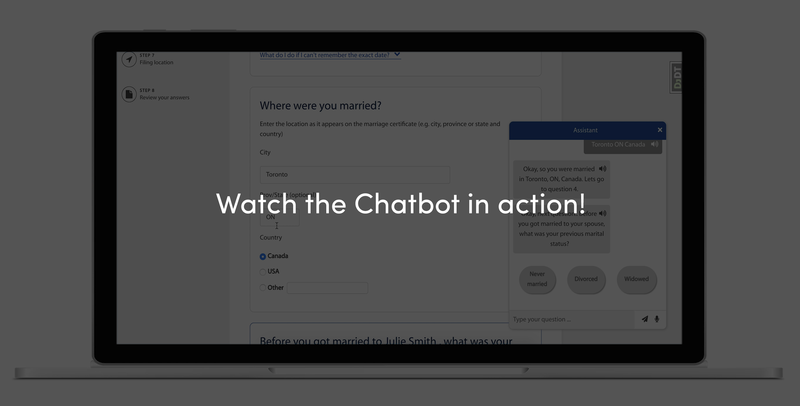 The Chatbot was created in response to call for solutions that could leverage artificial intelligence (AI) to improve the user experience of the Online Divorce Assistant. The Online Divorce Assistant is an existing application that helps users complete the required forms in order to file for divorce. The request was to create a solution that would work with minimal changes to the existing application. FreshWorks Studio developed a proof of concept version to demonstrate the power of AI. Adding a Watson powered chatbot for your users to interact with can be a powerful tool. By providing an easy, intuitive avenue for users to get answers to their questions, help with their problems, or interact with you application, adding a chatbot service can bring you into the twenty-first century. The Chatbot uses Watson's Assistant, speech-to-text, and text-to-speech services to create an interactive chatbot that can walk a user through a complex form. Users interact with the Chatbot in their preferred language, answering questions that are easy to understand. In turn, the chatbot will validate, format, and translate the answers before placing them into the form's inputs. The chatbot can also answer any questions the user might have while progressing though the form, and if it does not know the answer, can point them to resources that may help. All interactions on the page flow through the chatbot. Using the natural language processing of Watson Assistant, users are able to converse with the chatbot by speaking in a natural way. Text-to-speech allow the user to listen to the responses and speech-to-text enables them to respond using their voice. Dive in deeper into the development of an IBM Watson powered chatbot, check out the article written by our Full Stack Developer Kit Armstrong.